I think that it's really important that when you live with your other half, to not neglect having your "alone time." Just because you live together it does not mean that you need to constantly live out of each other's pockets and be around each other 24/7. If you do, this is when tensions can arise. Having time to yourself is of major importance because not only does it mean that you are still taking time out to do the things that you enjoy, but that the time you spend with your boyfriend/girlfriend/husband/wife is all the more special. The last thing you want to do when you're living with your partner is to end up resenting them! Boyfriend and I are in a position where on a day-today basis, we don't really know how much we are going to see each other. Last year, over the summer, we barely saw each other once a week. He is a very clever thing and was off at university working extremely hard on finishing his PhD. He needed that time to focus. And I 100% respected that. He called the shots on when we saw each other. It had to be that way. And now that we live together, the dynamics have changed again. We both work. But our schedules are completely different. I'm on regular hours that don't ever change. And he can be working anything from 8 to 12 hour days (sometimes more.) The time we spend together is precious. And it means that the time we have apart when neither of us are working needs to be spent taking time out to really relax and focus on the most important people in our lives....us. On Tuesday night, Boyfriend was out all day and for most of the evening. So I took the opportunity to have a completely girlie pamper evening. I had been out during the day with a friend, and picked up a few bits to help me indulge my beauty-holic side. I ran myself a hot bath, popped in a LUSH Golden Egg bath ballistic and was swept away into relaxation. 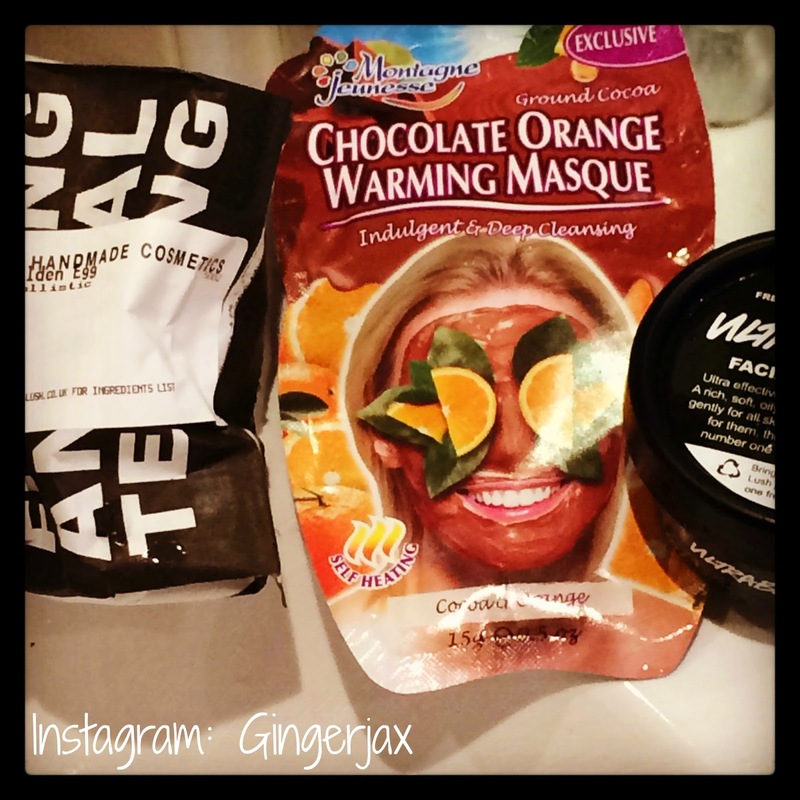 I picked up a really indulgent Montagne Jeunesse Chocolate Orange face mask, and followed up with my brand new LUSH Ultrabland Facial Cleanser. I switched my phone to silent, and spent a good half an hour soaking all my cares away. When I have a bath, I take the opportunity to banish any stresses or problems that I have. If I want to cry, I cry. If I want to sing, I sing, and if I want to laugh, then I just go ahead and let the giggles out. Nobody can hear me. It's my time to just completely be at one with myself. If you're in a relationship and you do live together, you do not want to be bringing your own stresses into the mix. Especially when you don't know how your other half is feeling. Boyfriend is a very intuitive person, and if there is ever something bugging me, even if I don't say anything, he knows. And if I don't want to talk about it. He really takes it to heart. And that makes me feel awful. He thinks it's something he's done. Which isn't the case at all. Because when it comes to our relationship, we are completely honest with each other when it comes to things that piss us off. After my bath, I heated myself up some leftover pizza I'd had boxed up from my Pizza Express lunch, and turned the living room into a cinema. I put Frozen on, turned out all the lights, and munched on chocolate chip cookies. And it felt so good. I was relaxed. I was happy. And above all. I was really looking forward to Boyfriend getting home. We all need time for just us. It's okay for you to have that time or to ask for that time. Don't feel that just because you live with somebody, you need to dedicate all your time to them and only them. That's not a healthy relationship at all. And it works both ways. Make sure your other half gets their own time Even if it's watching Match of the Day, letting them do their thing in the kitchen (this is one of Boyfriend's favourite ways to de-stress,) or making sure that they have a night out with their friends. Maybe your boy/girl really wants to do something for themselves, but is shy about telling you in case they upset you. Be intuitive and make the move first. Let them know that it's okay to have that time. Because the only way we can truly love others, is if we love ourselves first.